The Mahaney Dome at the University of Maine in Orono collapsed under the weight of snow Friday. 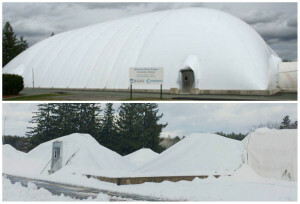 At top, the dome prior to the collapse, with the aftermath shown on Friday in the bottom photo. The dome is an air-supported structure that provides indoor practice space for athletes. It measures 200 feet by 200 feet and was 55 feet high at its center, according to the university.